Robert Collis (1900–1975) was an Irish doctor and writer.He was born at Killiney, County Dublin. He joined the British Army in 1918 as a cadet, but resigned a year later to study medicine. He was appointed Director of the Department of Paediatrics at the Rotunda Hospital, Dublin, and in 1932 physician to the National Children’s Hospital, Harcourt Street. He developed neo-natal services at the Rotunda, particularly for premature babies. He worked for the Red Cross in the Bergen-Belsen concentration camp after its liberation by Allied troops. He was instrumental in bringing five orphaned children from the camp to Ireland in 1947, and adopted two of them. He met a Dutch nurse in Bergen Belsen, Han Hogerzeil, whom he later married, after divorcing his first wife.Below is an excerpt of his report of Bergen Belsen after the liberation. “The camp is separated into two distinct portions-Camps 1 and 2. Camp 1 is a hutted encampment housing approximately 22,000 females and 18,000 males. Camp 2 consists of a series of brick buildings and houses approximately 27,000 males. The inhabitants of these camps are of mixed nationalities, with Russians and Poles predominating. Czechs, Belgians, French, and Italians are also present. The following is a brief account of the conditions seen on first entering these camps on April 17, 1945. It is impossible to -give an adequate description on paper. Camp 1. – A dense mass of emaciated apathetic scarecrows huddled together in wooden huts without beds or blankets in many cases, without any clothing whatsoever in some cases. The females in worse condition than the men, their clothing generally, if they have any, only filthy rags. The dead lie all over the camp and in piles outside the blocks of huts which house the worst of the sick and are miscalled hospitals. Approximately 3,000 naked and emaciated corpses in various stages of decomposition are lying about this camp. Sanitation is non-existent. Pits, with, in only a few instances, wooden perch rails are available in totally inadequate .numbers, but the majority of inmates, from starvation, apathy, and weakness defecate and urinate where they sit or lie, even inside the living huts. There is no running water or electricity. All water is being brought in by our water trucks. Camp 2. – Conditions in this camp are vastly improved in comparison with Camp 1. The inmates are housed in buildings, 600 to a building of 150 capacity. Sickness in this camp is much less and the death rate is about 10 a day. The inmates appear better clad and generally less emaciated than in Camp I, though signs of starvation are everywhere. An attempt is being made to bury the dead. Camp 1. – Riddled with typhus and tuberculosis. Gastrointestinal infections are very common and are probably enteric and simple gastroenteritis. No cholera or dysentery has been diagnosed. Erysipelas, scurvy, and starvation disorders are prevalent. Camp 2. – Enteric, tuberculosis, erysipelas. There is no typhus in this camp. Actually the state of affairs was worse than described above: for instance, when the corpses were more accurately counted the figure was nearer 8,000 to 10,000 than 3,000. In many cases the dead lay in naked walls of bodies around the huts, many of which were filled, literally filled, with the dead and the dying. Next to nothing had been done for these people for months. For a week they had had almost no water. There they lay, either three persons to a bunk designed to hold one or on the floor, in foul rags drenched in excreta, covered with lice. Death came chiefly through starvation, typhus, tuberculosis, and dysentery: 500 a day were dying from disease, and the guards killing more. In Camp 1, covering an area of 0.8 mile long by 0.4 mile wide and containing a large portion for administration and another for the crematorium and “accessories,” were kept 40,000 human beings confined most of the time to the huts on pain of being shot. Into this foul place came the British troops. The S.S. guards were got under control and forced to bury the dead and clean up the worst of the filth. The Hungarian guards were also employed, and an S S for help sent out. In the meantime the following British medical units were sent to the camp by the D.D.M.S., Second Army, Brig. H. L. Glyn Hughes, together with a contingent of the armed Forces, including military Government detachments, and began the colossal medical task of transforming a death-trap into a hospital, though it could not be regarded as a commitment which came strictly under the Army Medical Services, but the dictates of humanity required quick action: 32 C.C.S. (Lieut.-Col. J. A. D. Johnston, R.A.M.C. ); 11 Light Field Ambulance (Lieut.-Col. M. W. Gonin, R.A.M.C. ); 163 Field Ambulance (Lieut.-Col. M. E. M. Herford, D.S.O., R.A.M.C. ); 30 Field Hygiene Section (Major P. J. Fox, R.A.M.C. ); 76 Field Hygiene Section (Major F. R. Waldron, R.A.M.C.). Some days later these were reinforced by No. 9 General Hospital-600 beds (Col. A. R. Oram), and these have been followed up by another C.C.S. and another general hospital of 1,200 beds. The work carried out by these medical units under the direction of the S.M.O. Camp, Lieut.- Col. Johnston, produced results which have to be seen to be believed. The setting up of hospital accommodation of 17,000 beds in ordinary barrack buildings is one of the monumental tasks undertaken and accomplished. Beds, bedding, drugs, dressings, and a hundred and one other items of hospital equipment had to be found from one source or another, whilst nursing and domestic aid on a large scale had to be recruited and organized from among those internees capable of rendering assistance, and also from German sources. Only the superb initiative and untiring energy displayed by Lieut.-Col. Johnston made this feat possible. The Field Hygiene Section were meanwhile tackling the problems in hygiene which abounded in this camp of horror. Supervision of the clearing-away of corpses and filth, with which the camp area was literally covered, and the disinfestation by D.D.T. powder of the 40,000 inmates of the camp were among the manifold duties which fell to their lot in the struggle to control infection and prevent its spread. The antityphus measures undertaken were directed and controlled by Capt. W. A. Davis, U.S.A. Medical Corps (Consultant in Typhus attached to 21st Army Group from the U.S.A. Typhus Commission). The work carried out by the Field Hygiene Sections and Capt. Davis has undoubtedly resulted in preventing a widespread epidemic of typhus. About a week after the camp was uncovered a contingent of the British Red Cross arrived and were immediately thrown into the fray, doing anything and everything that they were asked. The women, under the leadership of Sisters Silver-Jones and Beardwell, were sent into the hospital area to take care of the first 600 patients admitted, most of whom were in a dying condition, covered with suppurating sores and almost all suffering from dysentery and many from typhus. The men took on the job of driving the now patients from the horror camp to the human laundry and then to the hospital. About two weeks later 100 medical students arrived and, under the direction of Dr. Meiklejohn, of U.N.R.R.A., took over the major job of feeding the internees in the horror camp. The stench, the foulness, which these young men endured is quite impossible to describe. Gradually the huts were got into order and the patients thinned out, partly by removal and partly by death, and the camp Was divided into two areas-one known as the Horror Camp Hospital, in which treatment of a medical nature is now being undertaken. In those huts outside the Horror Camp Hospital one or two students with 0 to 5 internee nurses look after 200 to 400 people who have not been medically sorted out. In the huts of the hospital area of the Horror Camp (Camp 1) three medical students look after some 150 patients, assisted by internee nurses and Hungarian guards. In a small division of a hut containing 8 to 10 patients may be found two cases of typhus, one or two cases of advanced tuberculosis, and three with dysentery. The complications most often met with in the typhus patients are thrombosis, gangrene, and bronchopneumonia. Cerebral symptoms are rare and usually fatal. Among the pure famine cases are many with oedema, gingivitis, pigmentation (? pellagra), emaciation, and profound lassitude. These medical students have done and are doing a work of epic gallantry and are worthy of all honour. The daily death rate in the camp, which was approximately 300, fell very shortly after the arrival of the students and is now approximately 60. There is no doubt that the provision of 40 tons of dried milk and of the necessary protein hydrolysate and glucose, and the supervision of the special feeding, have resulted in the saving of thousands of lives. 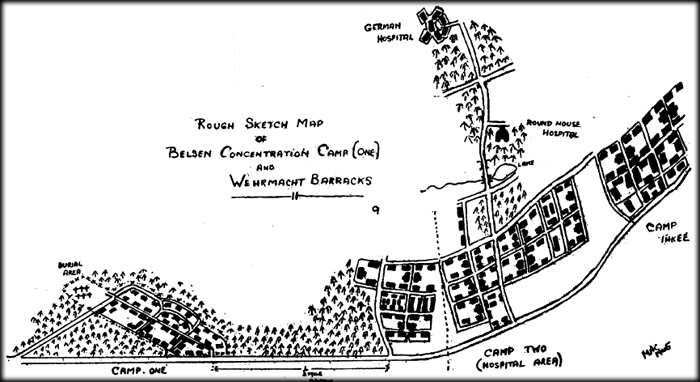 The accompanying map gives the general layout of the camp as it now exists. Camp I (the Horror Camp) is now practically empty. A day or two should see the last of the inmates cleared from the ordinary huts to either No. 1 Camp Hospital or to the hospital proper. The Horror Camp will then be burned. Camp 2.-Part of this camp is now under the control of an Army General Hospital, with already nearly 2,300 patients. It is rapidly expanding to 3,500. The larger portion of Camp 2 is still under the control of the original C.C.S. and consists of the main hospital area, containing 11,200 patients. It is divided into squares of five houses, the whole square accommodating approximately 700 patients. Each square is under the control of one medical officer from the R.A.M.C. Each house of 150 patients has one Swiss or internee or German doctor in charge. Each square has only one or two British trained nurses, the rest being either internee nurses or German nurses. It has been found necessary due to the lack of doctors and nurses from home to employ German doctors and nurses. No doubt the additional medical skill thus added have proved beneficial in a general sense, but the patients are naturally terrified of being looked after by Germans even under supervision, remembering how they were tortured in the past. It has been established that patients were often given intravenous infusions of benzol and creosote by the German medical staff, so that now, when the doctors approach with hydrolysate for intravenous infusion, the patients often cry out begging not to be taken to the crematorium. The main squares (see map) are for general treatment, while the three blocks at the back are kept for maternity patients and children. Probably nowhere else in the world at the present moment, certainly in no maternity, hospital, have obstetricians to deliver women who are actually suffering from typhus at the time of their confinement, but here this is quite-ordinary. The difficulties facing the staff have been truly appalling, but now very few women are getting puerperal sepsis, though many of the babies are still going down with neonatal sepsis. The Children’s Blocks are the happiest in the whole camp. Many of the children are emaciated, showing the utmost marasmus, and many are sick; but also many are now beginning to recover, and, strange though it may seem, these, particularly the children under 7, do not show the terror symptoms which are perhaps the most terrible aspect of the adult patients’ mental state. Already they are laughing and smiling again. Many are going to recover altogether. But our responsibility will not end then, for most have no homes to go to, no parents, no ordinary future. Surely somewhere in the world there are people who will come forward and care for these children and give them a home again. In the general squares of the hospital area the main treatment up to the present has been that of feeding those in the extreme famine condition. Dr. Janet Vaughan and her team are doing invaluable work with intravenous hydrolysate while making important scientific investigations; but it is not easy to give an intravenous infusion with one hand and a bed-pan with the other, and little can be expected from these specific treatments. Few of the important scientific problems can be tackled properly until sufficient nursing facilit.es can be obtained. In the hospital area it is still necessary to nurse patients with open tuberculosis and typhus in the small overcrowded wards containing other patients. Without x-ray apparatus diagnosis is often only provisional. Camp 3. – This area contains approximately 8,000 persons. They are supposedly well or at least convalescent and have been transferred from the other camps. They are able to walk and generally able to look after themselves but many are pitiably weak still, and now quite a number are getting sick and being transferred back to the hospital once more. Typhus has broken out now in Camp 3 quite seriously, and the problem of the management of this vast collection of persons from the social and medical points of view is one of the most difficult facing the directors of the camp. If the map is referred to again two other hospitals will be seen the Round House Hospital and the German Hospital. These have not yet been opened, though over 1,200 German patients have been removed from the latter, and it is now being got ready for admission of the patients from the camp. One wing is at present being used for the treatment of a number of orderlies and R.A.M.C. personnel who have themselves contracted typhus in the course of their duty. The opening of these new hospitals will greatly help the more advanced types of medical and surgical therapy. Finally comes the immense problem of rehabilitation of these poor, abused, broken people. First the demands of their bodies must no doubt be met, but many are as wasted in mind as they are in body. Here expert workers are necessary, and vast quantities of books in all languages-Russian, Polish, Yugoslavian, German, and French, together with all kinds of sewing equipment, such as needles, thread, thimbles, etc., for the women; and much besides. The number of French internees cannot be more than 200, and all whom one speaks to-who are recovering are full of hope and thinking only of the day of their return to France; but many thousands of those from the East, particularly the Poles, have no homes to go to, have apparently no future, no hope. The problem of what to do with these forsaken, almost lost, souls is immense, but one which if not tackled and solved will make all our efforts here mere waste of time, for then it were kinder to have let them die than to have brought them back to mere existence and more suffering in a hostile world where they have no longer even a hope of being able to compete in the struggle of the survival of the fittest, and must inevitably go down. This is a brief preliminary report of Belsen Camp to give the medical profession in Britain some idea of the medical problems involved. It is a complete understatement. No words can describe the stench of decaying faeces, rotting bodies, and burning rags, which in the first weeks one could begin to smell miles from the camp, and it can but be left to the imagination of the medical men who read this article to appreciate what the doctors, nurses, and students at Belsen have endured and accomplished. Since the camp was taken over from the Germans more than 20,000 internees have been buried; some 30,000 are left, of whom 11,200 are in the main hospital area. Now the Horror Camp is being rapidly emptied and the first emergency problem of hospitalisation at Belsen has been accomplished, though an enormous task lies ahead if these poor people are to be cured and rehabilitated. It will be possible to repatriate those who are fit to be moved to their own countries, where further hospitalizations and rehabilitation will be a matter for their respective peoples ; but there will still remain a very large number, possibly thousands, of Stateless and homeless people whose welfare, both medical and general, and ultimate assimilation into normal society must remain as an almost insoluble problem for years to come. All honour is due to the R.A.M.C. and the doctors, nurses, and medical students of the British Red Cross and Order of St. John, under whose umbrella a large number of people of different nationalities have worked in perfect harmony. Dr Collis was involved in establishing Cerebral Palsy Ireland. One of his first patients was Christy Brown, a cerebral palsy patient who later became a notable author himself.Collis proofread Brown’s first attempt at an autobiography. This entry was tagged Bergen Belsen, History, Holocaust, Irish Doctor, World War 2. Bookmark the permalink.